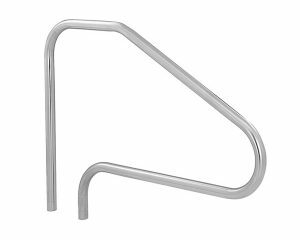 Create a sophisticated look by adding a handrail and/or ladder with your new liner. Contact us for any questions or custom requests. Powder coating available in White, Taupe and Rock Gray, SealedSteel available in White, Taupe and Pewter Gray. The Economy ladder is our top-selling residential pool ladder. Made from beautiful stainless steel for a classic look, or add a layer of protection by powder coating in one of our designer colors. Choose an ultra durable plastic, or stainless steel tread. 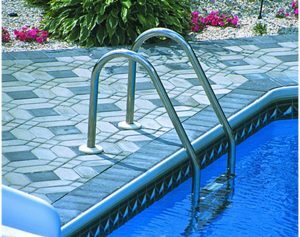 Rubber bumpers are fitted to the ends to protect a vinyl liner where the ladder meets the side of the pool.